Both Gavin and I have a truckload of allergies between us and with eczema often being hereditary I think we were fighting an uphill battle from the start. In fact research suggests that a baby has a 30% chance of developing allergies if the mother has allergies, and a 60% chance if both parents have allergies. If both parents have the same allergy for example asthma, then the risk of allergy in the unborn baby reaches 80%. With that in mind I took a pro-biotic supplement during my pregnancy – some research shows that these supplements can reduce the risk of your unborn children developing allergies. But there is no conclusive evidence to support this theory yet. There is a lot of research and a lot of dividing opinions about all things eczema, that I could probably have written a book here. So this article is by no means a complete view. Please take the time to read up on the various debates for yourself before trying any of my methods. 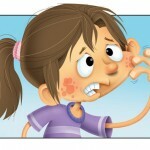 Eczema (also known as dermatitis) is the name for a group of diseases that are the result of inflammation of the skin. 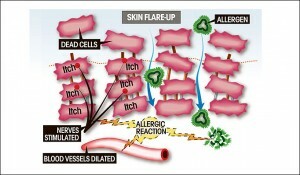 The inflammation experienced with eczema is a reaction of the immune system to a complex series of factors. These include the genes you inherit and external elements such as the climate and the food you eat. 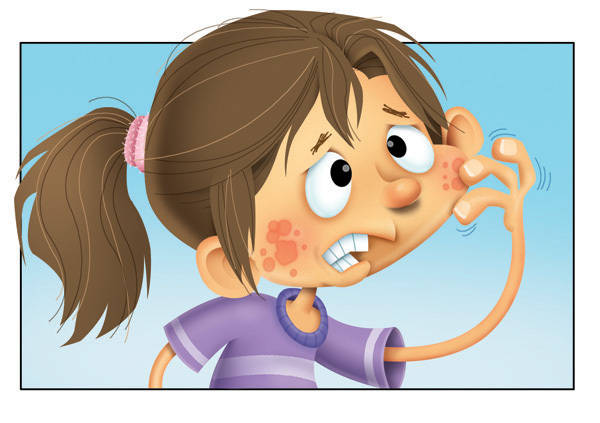 There are many different forms of eczema which can affect any age group, and the pattern and severity differs from individual to individual. It is intensely itchy and scratching can cause bleeding and infection. Emma first showed signs of eczema after her 2 month old injections. Sam’s began after his 1 year old injections. (The doctors assure me that there is no link between the vaccinations and the children’s eczema, but some people believe otherwise). Thankfully Emma never had any on her face, but at times her entire body was covered in it. She was such an angel that she rarely ever complained about it, and she hardly ever scratched. I wondered if it was so normal to her having got it so young that she just accepted it and got on with life. Sam tended to have his on his feet and behind his knees and elbows. Just before Emma turned 1 she had an extreme allergic reaction to hummus – which we later found out contained sesame, which is a known allergen. This resulted in an ambulance ride, and a night in hospital after an adrenalin shot. Bless her but I did have to take a photo as she swelled up and up and up. You should of seen how fast she crawled after the adrenalin kick in too. As I too have had allergic reactions although not this bad, I was strangely calm during the incident. I think it was because I knew what was happening straight away and what to expect. Anyway this allergic reaction was somewhat of a blessing in disguise as it got us promptly into the specialist allergy clinic and she had a full panel of blood testing to find out what if any other allergies she had. I know some people can wait months and years for this, and often eczema patients don’t ever get this luxury. The results were a bit disappointing as it showed the 2 big problems to be cat and grass. My cat arrived in our house first so I’m afraid I wasn’t willing to give her away, and grass is a real tricky one to keep your inquisitive 1 year old from crawling all over. Like everything the best treatment is prevention – so trying to reduce your exposure to known allergens is one of the first steps. (I found this incredibly difficult, although I know of some very dedicated parents that do control their child’s allergy this way). The second way of trying to prevent flare ups is to keep the skin moisturised to an exception level. Dry skin has small cracks in it which allows allergens to slip through the skin’s surface and begin irritating it. This allows the skin to do it’s normal job of fighting off the allergens as they attack. I feel the biggest problem with eczema is that what works for one person does not work for the next. So reading about and trying the latest cure or next greatest cream can be very disheartening. The NHS prescribe a variety of different emollients (emollient is the medical term for a non-cosmetic moisturiser). 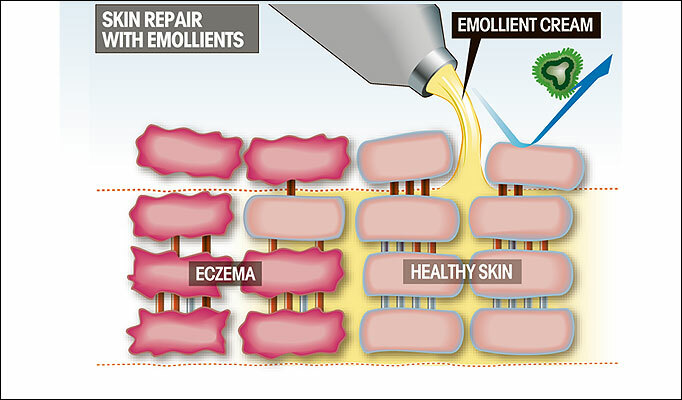 Emollients are necessary to reduce water loss from skin, preventing the dryness normally associated with eczema. Emollients are available as lotions, creams, gels and ointments. The NHS also prescribe bath additives to try and stop the skin drying out and also so you don’t need to use soaps that can often aggravate the condition. In addition you can get steroid cream for flare ups that try and reduce the inflammation and calm the skin. You can only use these for short periods of time as they have been known to thin the skin. Unfortunately neither the moisturisers or steroid creams ever seemed to make a difference to Emma. All it seemed to achieve was to make it less red, but never completely gone. We went through several different moisturising products also, each doctor we saw claiming that this next one was the best. None of these worked for Emma. On the other hand, the steroids did tend to help Sam’s eczema and his skin was clearer at times. I was really at my wits end by the time I found the website TALKEZCEMA. http://www.talkeczema.com/. First thing I did was register and they sent me a welcome pack of several different creams to try out. Some of the creams sent were available on the NHS and some were available to purchase. The website has some excellent educational videos about how to effectively apply creams and tips for getting your child to comply. After watching these I really began to understand how moisturising helped. TALKEZCEMA is an independent website so it does not recommend any products but it does link to many products that have been awarded the British Allergy Foundation seal of approval. Products are as varied as clothing suggestions, diet suggestions, water softeners for your household water supply, laundry and cleaning products. I decided we needed to try our own ideas as nothing from the NHS was helping. So after reviewing lots of information I decided in July 2011 we were going to attack eczema head on with as many different answers I could find. I wasn’t patient enough to try things one by one to see what really worked – I tried more of a “let’s throw everything at it” approach, mostly because I couldn’t stand to see Emma and Sam suffer any more. I started using Surcare Laundry liquid for all the children’s washing. I bought bamboo sheets for their new beds (just moved from cots). Bamboo is naturally anti bacterial and anti static and highly dust mite resistant – ideal for those prone to allergies and asthma. You can buy clothing also, but as you’d expect it’s pricey. I started using Salcura Zeoderm cream twice a day. It soothes dry skin, has itch relief, anti-bacterial and anti-fungal moisturiser. Best of all it is free from steroids, paraffin, alcohol, parabens, lanolin, anti-biotics and any other harmful chemicals. I also used the ever controversial Vaseline petroleum jelly as a barrier. This just seemed to make sense to me to put a barrier over Emma and Sam’s skin to block out all the nasties. There’s a lot of argument for and against using petroleum jelly so please understand these views before you try it. I think the Salcura cream was what really made the difference. They make several products for eczema and other skin conditions and for us they have got it right. Within 3 days of using the Zeoderm cream and layering Vaseline over the top Emma and Sam were both eczema free for the first time in 2 years. This worked better than the steroids that were prescribed. I was so over the moon I think I actually cried. Finally we found something that worked. It continues to work, I don’t have to think about eczema everyday any more. Now that Emma and Sam’s skin is so good we don’t need to use the creams as often or use as much of them. It’s a shame it’s not available on the NHS, but it’s worth the cost to have lovely clear skin.